In quite a few articles on this blog I present example images that use environment lighting and a detailed backplate. I found it not very intuitive at first to set up a scene in a way that gave me some control so I thought I'd share my findings here. When using environment lighting with backplates you need of course have access to good resources and one of the best free resources I found is the sIBL Archive on hdrlabs.com. 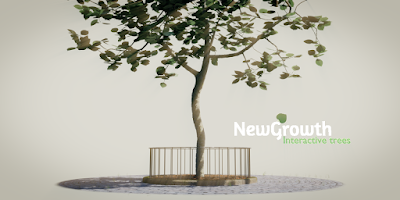 Each archive contains normally three images: a high resolution backplate, a low resolution hdri environment map and a high resolution hdri reflection map, all in a format that can be used by Blender directly. Just make sure you use an Environment Texture node (not a regular imaged texture). The environments we use here are all equilateral but Blender also has the option to use mirror ball images. A high resolution (8000 x 4000 pixels) backplate is already huge and an hdri image is even bigger (typically 4 to 10 times) both because it uses more bits to store the information in each color channel and because it appears to compress less well. It would be wasteful to keep all this in memory if you don't need it because memory already is a precious commodity when rendering. Therefore each map has a different resolution: the backplate is very detailed, but is plain rgb, not hdri, and the environment map is very low resolution since you won't see it directly and lights don't need fine detail. In reflections however you might need some detail (if you have very shiny surfaces where you can see the environment) and in that case you might want to use the medium resolution reflection maps. In the image at the start of the article I used the low resolution enviroment map and as you can see the very glossy monkey on the right doesn't show a recognizable image in the reflection. 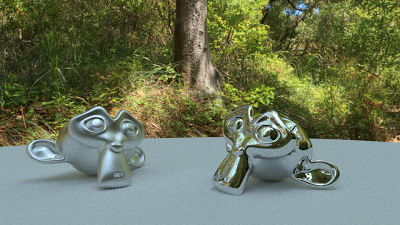 In the image below we used a medium resolution reflection map which gives fair result while still being much smaller than an hdri map with the same resoltion as the back plate would be. If we can see the background we have to create a setup for the world material nodes where we couple the highly detailed background image to the lower resolution environment or reflection map, in such a way that when we look a the background directly we see the backplate while in all other cases (like diffuse and specular reflection bounces for example) we use the hdri map. This is possible by using Cycles' light path node. The light path node has an Is Camera Ray socket that will have a value of one if we are dealing with a camera ray and is zero otherwise. A camera ray is a ray that shoots directly from the camera so if our background is hit by a camera ray we present the high res backplate and in all other cases we present the hdri environment map. 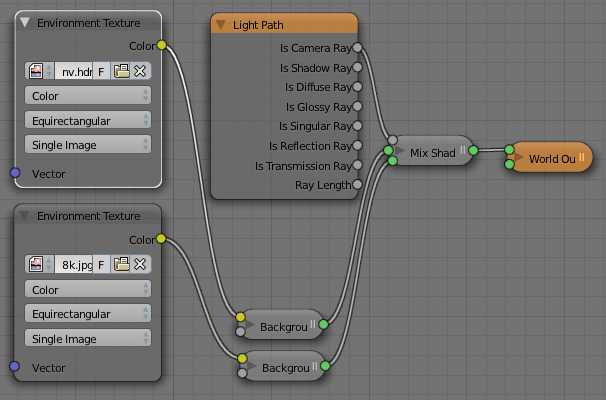 This is done by drivin the mix shader in the node setup above by this camera ray. Note that the backplate shader is the one that plugs into the lower input socket of the mix shader. When you create your scene it is convenient to place your camera in the center, i.e. at location 0,0,0 because these environment images are shot like a panorama with the real world camera in its center. This doesn't have to be exact but in indoor scenes some distortion might be noticeable if you rotate the camera while it is not in the center. 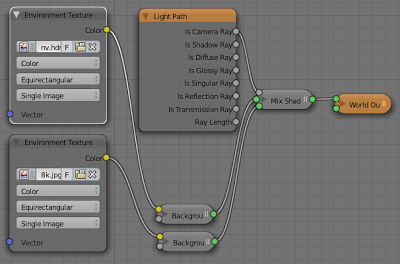 The generated coordinates are fed through a vector mapping node before being connected to both background shaders. We now can rotate both images at the same time by changing the z-rotation value of the mapping node. (The other roatations are generally less useful as in these good quality pictures there is hardly ever the need to correct a tilted horizon for example but if need this could be done by rotating around the x or y axis).